The plundering of natural resources is a major form of capitalist exploitation. Land, in particular, acquires an important place in such exploitation mainly because of its speculative value. India, especially in the past 25 years of neoliberal onslaught, has witnessed the massive plunder of land under the guise of major infrastructure projects. Nonetheless, such land grabbing has provoked mass resistance movements at many such sites and farmers and tribal communities have fought hard against such assaults on their livelihood. New Socialist Alternative (CWI-India) in Pune, is very actively involved in one such struggle – that against the proposed Pune International Airport. Pune, a major city with significant industry and service sector companies, is situated in Western India, around three hours’ drive from Mumbai (Bombay). Infrastructure projects motivated by capitalist interests are implemented under the PPP (Public Private Partnership) model which in reality, however, translates into being in a State-Corporate nexus. The task of acquiring land, causing the displacement of its owners, is carried out by the government in the name of ‘public interest’ and the land acquired is then handed over to capitalists for the project to be carried out. Yamuna Expressway: land acquisition or plunder? The case of the Yamuna Expressway, in Northern India, is an example. It was proposed in order to connect the major cities of Greater Noida and Agra, and would be of a total length 165 km, requiring 4,092 hectares of land. But, the land that was actually acquired under this project was 44,000 hectares – more than 10 times what was actually required! So, what was done with this excess land? The contractor for the Expressway – JP Infratech Limited – was ‘awarded’ 5 blocks of 500 hectares each (Total 2,500 hectares). The same was done with other real estate developers like DLF and Unitech. These lands have been used to build expensive townships, elite shopping malls and five star hotels, multiplexes for entertainment and also cricket and hockey stadiums. Moreover, this land acquired under ‘public interest’, was used to build a Formula One racing track! The land was bought from the original owners at $12 per square meter. And in the end, when this land was sold by the real estate developers, the price per square meter was $512.5, around 41 times that of the original. This project got completed in 2012. The yearly profits of JP Infratech for the years 2011 and 2012 were $21bn and $19bn. This clearly exposes the naked reality behind land acquisition in India. CAG concludes in its same report “…Such kind of land acquisition, that involves plunder of lands of farmers from rural India, is a direct transfer of wealth to the Corporates.” Such projects can never be claimed as development. In October 2016, the government announced the use of the site of Purandar (eastern Pune) to build an international airport. While the idea of an international airport for Pune has been toyed with for quite some time, this announcement came as a shock to the residents of Purandar and soon they started to protest against it. New Socialist Alternative members from Pune have visited the affected villages and conducted multiple meetings with the inhabitants. One of the first questions we had to deal with was assessing the need for such a project. Since the beginning, the government has been making announcements with fanfares and claiming to have addressed a long-standing need of the city. But is that really the case? It is being claimed by the government that a Pune airport is a real need. But, Mumbai airport, 3 hours drive from Pune, has the capacity to handle air traffic of 40 million passengers per year and that of the proposed Navi (New) Mumbai Airport, a 2 hour drive from Pune, will be 60 million. Also, for the elite class of Pune, corporate and service sector people, Navi Mumbai Airport would be nearer than Purandar because of an express highway to Mumbai. Then, the question arises: why does the government really want an airport for Pune? What are the main motives behind it? In the case of Purandar airport, the government initially proposed that around 1,200 hectares of land would be required. Then, it was raised to 2,000 and now, the requirement has become 3,000 hectares. The Mumbai airport has an area of 750 hectares. Logically, Pune being a smaller city than Mumbai, it would be carrying less national and international air traffic. Even a future projection of more traffic would not be able to answer why 3,000 hectares is needed. It is crystal clear that it is not only an airport that is the aim here. The excess land is going to be used for capitalist plunder – real estate projects, five star hotels, and malls. All this is specifically for the elite who can bear the cost of flights regularly. The original residents of this place – the farmers and their descendants – are going to have no place here. How do investors raise the capital for such projects? Do they do it by digging into their own pockets? Such investments often ride on some kind of debt bubble. In India too, such investments are done by borrowing mainly from public sector banks. At the end, when these projects turn out to be white elephants, the loans are never paid off. The governments, servile to these capitalists, then write off these loans, transfer them to NPAs (Non Performing Assets) or restructure them. But they are rarely paid back. Who are the ones who have to pay for this? The common people of the country! This is done through various indirect taxes. The recent example is of the central right wing BJP government waiving around $700 million loans for the corporation that includes that of liquor baron, Vijay Mallya, who fled the country some months ago. The above-mentioned scenario can be seen in relation to airport developers as well. Look at the financial situation of two major companies in India! The GVK group who built the new Bengaluru and Mumbai airports, as of today is carrying a loan of $3.8 billion. The other – GMR Group – who built Delhi and Hyderabad airports, carries a loan of $6.4 billion. How are these groups going to build the Pune airport under the burden of such heavy loans? The answer is simple:- by setting up new loans by showing new investment projects in hand. The major crisis of the Indian banking system today arises and persists due to the interests of the corporations and right wing political parties. Incidentally, Purandar is not the first site identified for an airport. Earlier, a few other sites were also identified. While no airports were constructed, the area saw a sharp spike in land speculation and associated transactions. Nonetheless, the state is determined to go for an airport project at Purandar and push for it recklessly. Enraged by all these things, the villagers at Purandar started protests straight after the announcement about the airport. A few of the villages passed resolutions against the project. However, as observed in many such struggles, as things proceed further, the state uses various tactics, from cajoling to repression to scupper such struggles. One of the most powerful tactics they use is throwing big buck figures in compensation packages for land. These things could easily wear down such struggles. Hence, sustaining them requires providing leadership with correct strategy and tactics. After being aware of the protests from villagers, New Socialist Alternative stepped into the struggle. We explained the predatory nature of the capitalist interests behind such projects to the villagers, advised them to form a committee of affected villagers to coordinate the struggle. New Socialist Alternative, Pune has played a leading role in forming a committee in Pune city that has involved different leftist organisations. The committee has visited the villages and supported the struggle. 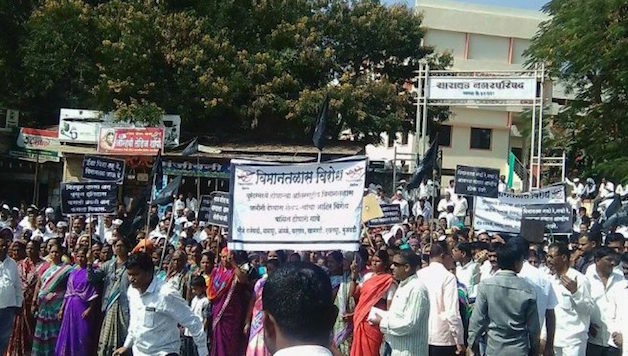 Also, the committee plans to take up many protest actions that provide support to the villagers from Pune city. New Socialist Alternative members have arranged meetings from village to village, and meetings at less populated areas in order to be able to discuss the impact with everyone getting affected. Sometimes, the meetings have lasted even until midnight. New Socialist Alternative (Pune), along with both the committees, gave a call for rallies in the affected villages to unite in a rally at the collector’s office to show our refusal to give up land. This solidarity has given confidence to the villagers to go forward in struggle. In the early stages of our involvement, the administration could successfully push for a survey by throwing in some false promises. Villagers realised it later and then we together stopped the survey at certain sites. Emboldened by it, this was replicated in other villages. In the aftermath of such protests against state authority, police repression is being stepped up. On a couple of occasions the police threatened New Socialist Alternative members, telling them not to intervene and that we should not have anything to do with this. On 26th of December, Sagar from New Socialist Alternative, Pune, was threatened by the police not to intervene or else he would be booked on charges of instigating public unrest. The administration is also spreading rumors about organisations like ours involved in the protests as “extremist” organisations. But, since we are working closely with the villagers, such tactics have been counter-productive. Together we are taking the struggle forward. Previous articleTrump and China: Heading for Conflict? Next articleDefeat the Right-Wing and Corporate Assault on Our Health Care!